Consider this silicone case as the perfect partner for your beautyblender sponge. 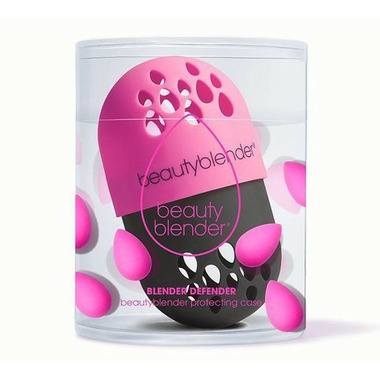 Inspired by the interlocking sides of a pill capsule, the portable holder makes storing and carrying your beautyblender on the go easy, protecting it from grime and germs. Better yet, the shatterproof flexible capsule can hold up to two damp beautyblenders. This is such a useful product to have if you own a Beauty Blender (or any face sponge really). It's perfect for travel and storage. The case is made of flexible silicone and the vents allow for the sponge to air dry safely and properly. I'm very happy that I finally have something to keep my blender clean and protected at all times. This is a great little carrier for my beauty blender! I had been leaving it on my counter to dry which is a bit gross, esp when I travel so much! Its simple to use and the air pockets allow my BB to dry throughout the day, regardless of where I am!